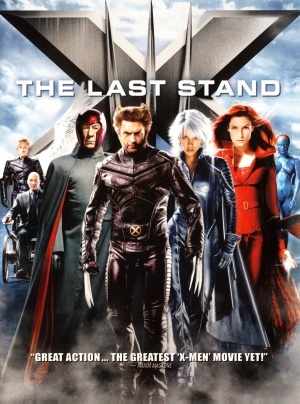 X-Men: The Last Stand is the third installment in the X-Men film franchise. Brett Ratner took over from Bryan Singer as the director of the 2006 sequel, which completed this trilogy of films that began with the original 2000 film. Hugh Jackman would appear as Logan/Wolverine in nearly all of the subsequent X-Men films including 2009's X-Men Origins: Wolverine, 2013's The Wolverine, a cameo in 2011's X-Men: First Class as well as 2014's X-Men: Days of Future Past and 2016's X-Men: Apocalypse and 2017's Logan. The film adapted the "Dark Phoenix" comic book storyline, and would later be adapted again with the cast of X-Men: First Class in 2019's Dark Phoenix. The American soldiers guarding Alcatraz island are seen swapping in their M16A2 rifles for plastic "Cure" rifles. Soldiers surrender their M16A2 rifles in favor of plastic "cure" rifles. A soldier at Alcatraz is seen tending to an FN M240D machine gun, as noted by its barrel length and spade grips. For some reason, it is also fitted with the bipod of the infantry M240B/G models. A soldier in the back right tends to an M240D machine gun. Another soldier is turning in a Browning M2HB machine gun to the armory. Two of Magneto's brotherhood members are seen using Remington 870 shotguns when Wolverine (Hugh Jackman) enters the camp. A member of the brotherhood armed with a Remington 870 shotgun. A member of the Brotherhood is seen using a pistol gripped Mossberg 500 Cruiser before being killed by Wolverine (Hugh Jackman). Wolverine kills a brotherhood member armed with a Mossberg 500 "Cruiser". After the armored van that transports Mystique (Rebecca Romijn), Multiple Man (Eric Dane), and Juggernaut (Vinnie Jones) is commandeered by the Brotherhood, one of van's guards uses a pistol that fires "Cure" darts to try and shoot Magneto (Ian McKellen) The pistol is fitted with a lime-green laser sight. The guard in the armored van loads a 4-round dart magazine into his Cure pistol. The guard shoots Mystique with his Cure pistol. Note lime-green laser. Magneto shows the Cure pistol to Jean Grey/Pheonix (Famke Janssen). Magneto levitates the Cure pistol (here a CGI rendition) before Jean disassembles it with her powers and threatens him with the cure darts. The U.S. soldiers prepare against Magneto by swapping their metal weapons for plastic cure rifles instead. They are seen in the hands of the soldiers guarding the mutants accepting the "cure" and all the soldiers at Alcatraz are seen using these weapons. The designation is seen in two scenes (one of them deleted) showing the weapons in transport crates. The "Cure" rifle with its side-plate removed. The design resembles the Heckler & Koch G11 in general, with FN SCAR folding/collapsible stock. The inside parts are very similar to the rotating bolt mechanism. Note the weapon has no such hole for a detachable magazine. And the double triggers are from a cheap Paintball gun. Soldiers pick up digital camo Cure rifles. A soldier armed with an XM-92 Cure rifle guards mutants waiting in line for the cure. A spec-ops soldier sneaks up on the Brotherhood camp armed with a Cure rifle, fitted with a flashlight. Soldiers fire on Magneto's "pawns" with their XM-92 Cure rifles. A closeup of the broken magazine for a Cure rifle. Note that the second shot is slightly rotated from the first; one of the darts is obscured by another. Some of the U.S. soldiers defending against the Brotherhood on Alcatraz island use shoulder fired launchers that launch exploding projectiles, releasing cure darts in volleys. A soldier fires a "Cure" Launcher. U.S. soldiers on Alcatraz use a three barreled cannon to fire large "Cure"-releasing disks at Magneto and his troops on the Golden Gate bridge, but he lifts up parts of the bridge to deflect the darts. Soldiers wheel out a "Cure" cannon. Soldiers load a projectile into the "Cure" cannon. It is strange that this is shown as the projectile being loaded, since three discs are seen in flight when it is fired. In the film, all the US soldiers are ordered to turn in all metal items; guns, dogtags, etc (announced over loudspeaker by R. Lee Ermey). But interestingly enough, they still have metal in their helmets and boots - e.g. the boots' eyelets and shanks. All soldiers are asked to turn in all metal, but interestingly enough, they still have metal in their helmets and boots.